I made a post on Reddit and one of the posters told me to visit here, because this is about performance and I would like thoughts on my performance results. Here is how I am set up. In HWInfo64, the motherboard sensors, the 'Vcore' displays as 1.312V current and minimum with the maximum displaying 1.352V. 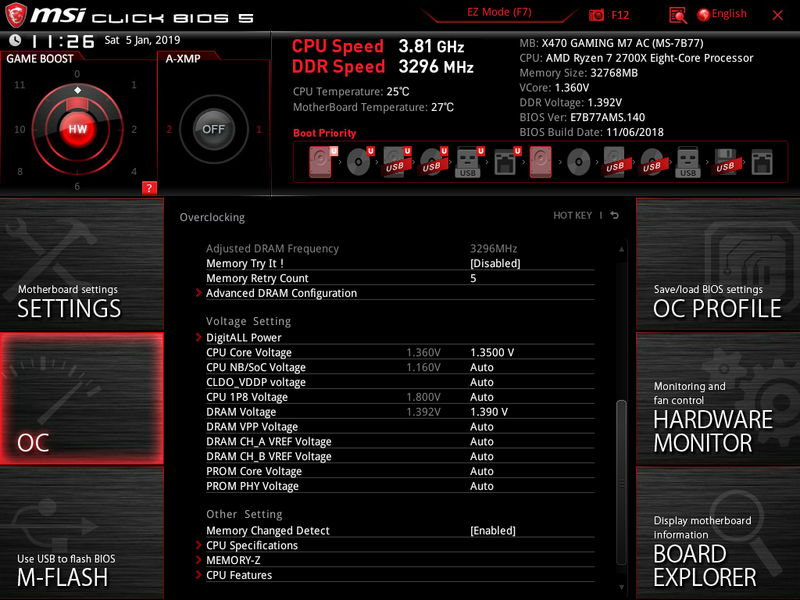 It is set explicitly to 1.3V in bios and displays as such everywhere else. 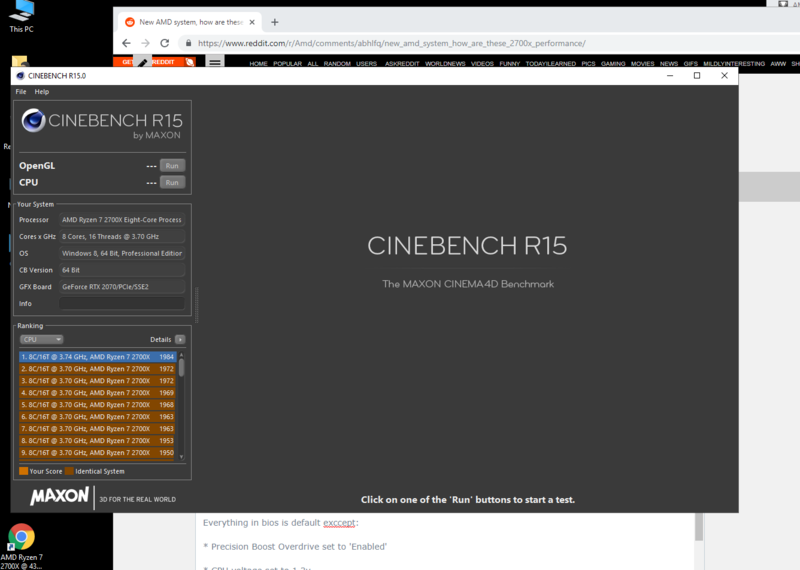 Running Cinebench I do see it rise from 1.312V to 1.352V. When set to default voltages it displays 1.44V. I have not kept this BCLK OC for day-to-day use. Time to use this machine as normal. The userbenchmark.com results sit at position 4 (for the first results) and the second result made a few hours ago, should be at position 2 but is not showing yet. Does anyone have any thoughts on these results based on how the system is set up? Some on Reddit found the results to be surprising. I am glad to now have a 2700x and I am really enjoying the new system. I am also looking forward to the possibility of an upgraded CPU without a new socket and board in 2019. When using PBO, I was under the assumption that one was supposed to leave the Core Voltage on "Auto". 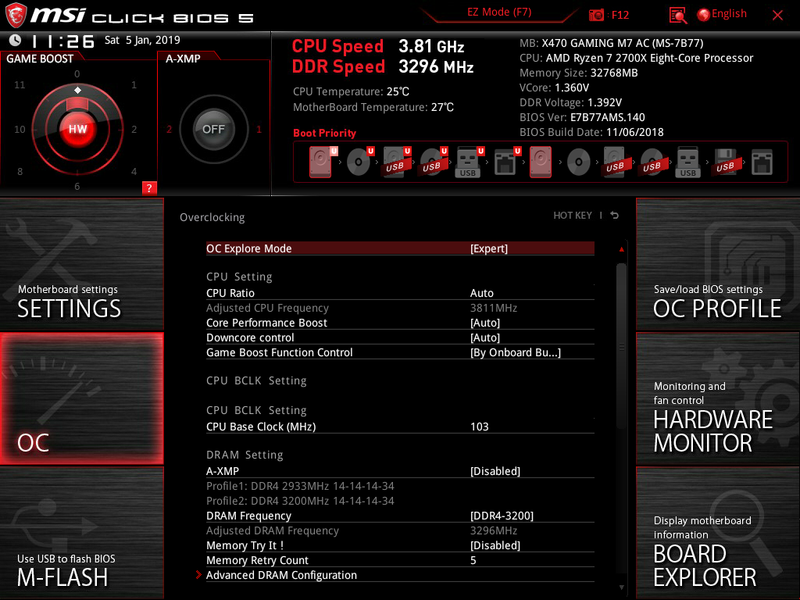 Those Cinebench scores appear extremely high for a non-overclocked 2700X. 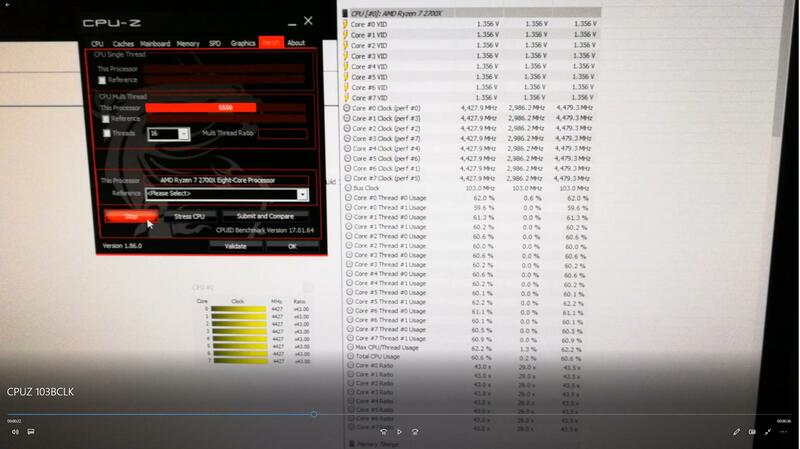 I have an MSI X470 gaming pro carbon, and also noticed a discrepancy in the Vcore voltage reading between what I have set in Bios, and what HWInfo64 shows. Setting the Vcore to 1.425 in bios results in HWinfo64 showing 1.433V. The same applies for Ram Voltage as well. Setting ram voltage to 1.4V in bios, but shows up as 1.409 in HWinfo64. I brought this up in another thread but never received a through answer. I think that's the highest scores I've seen using PBO and not manual clocks. About 100 points above my scores and (1860-1875 usually) those usually line up with others, or abit above. Weird. That's usually the score you see when using a manual clock around 4.2ghz. What RAM timings do you use? What RAM and timings do you use? Does PBO oc all cores at same speed like 4.3GHz? Set CPU Voltage to 1.3V in MSI M7 AC bios. Enable PBO and that is it. 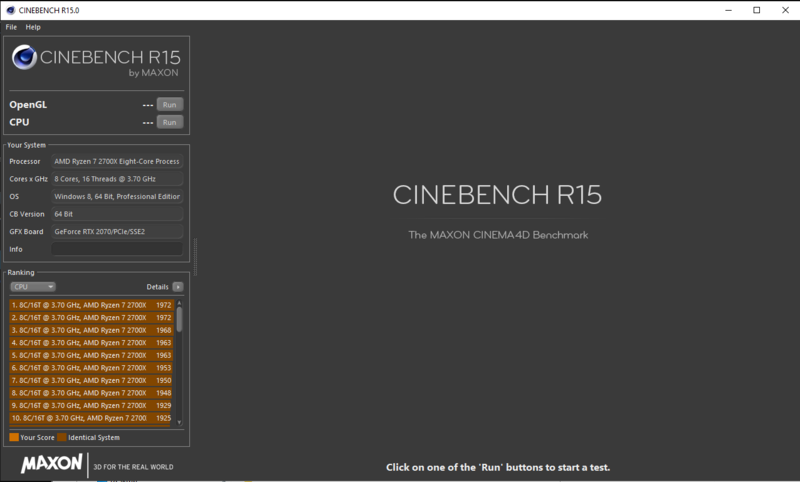 Cinebench 1960+. I have even set the CPU Voltage to 1.2875V earlier today, that ran even cooler. I will post updated results later. On this machine it does. All cores show as boosting consistently. All cores will boost... With my cooling and a -.1 voltage offset, rendering/ synthetic tasks boost all cores to 4.1 or 4.0 GHz (closer to 4.1 - but after heat soak in Intel Burn Test, they creep back down to 4 GHz). "Lightly threaded" loads 4.2 GHz on the utilized cores. One or two threads, peaks up to 4.35 GHz. I wouldn't mind running manual voltage, but offset really saves power, down to like .7 volts on low-use cores. PBO even with the offset shoots up the voltage to 1.4 to 1.45... Without offset, up to 1.55v. I did an IBT run at 4.2 GHz locked at 1.4V, and my power consumption jumped by 70 Watts at the wall compared to just using PBO. Could I lower the Voltage, probably, but I just wanted to do a quick run since I'm spec'ing out a new PSU. I don't get how you achieve that score with PBO. What do your cores boost to during the test? I get around 1860 +-10 with PBO and can achieve ~2000 with manual clocks as a reference. That seems to be in line with other benches I've seen. 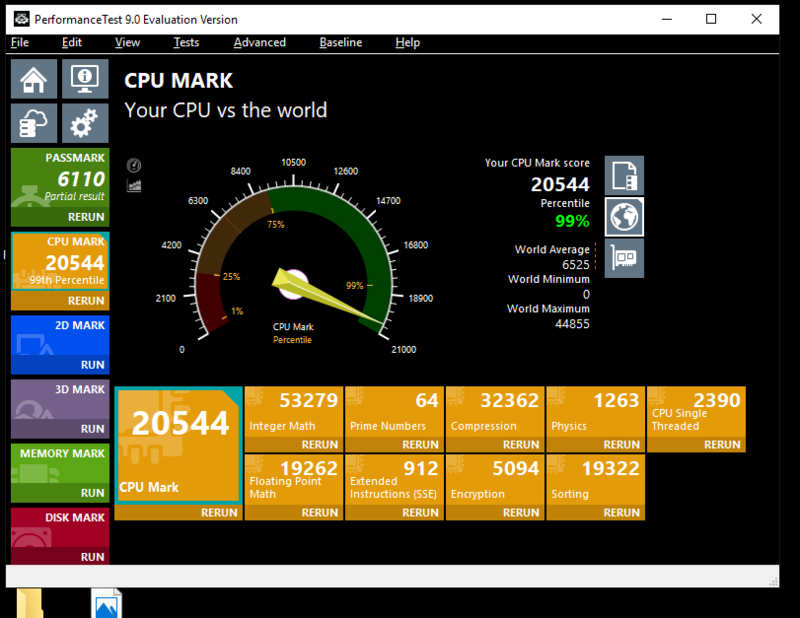 You can see all cores boosting to 4.43GHz and gave this result. Today I took the BCLK even higher to 103. And interestingly enough a slightly slower Cinebench of 1947. 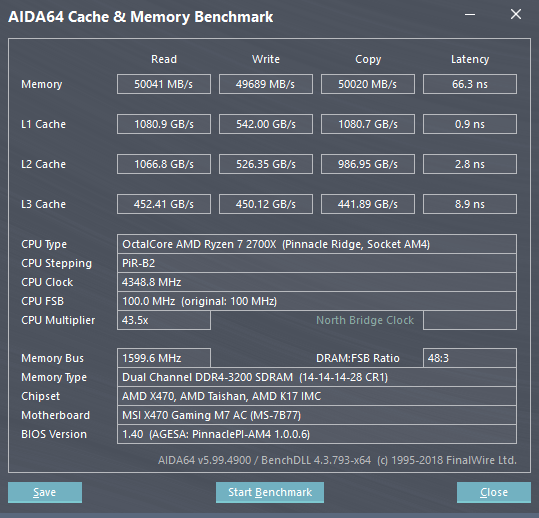 Memory timings from Ryzen Memory Calculator of 'fast' for kit (F4-3200C14D-32gtz). That's it, no setting of core frequencies or anything else. This is why I am posting to see if others get similar results. I can't imagine if say the 3700X with all its cores boosting to 4.5GHz. Wow.